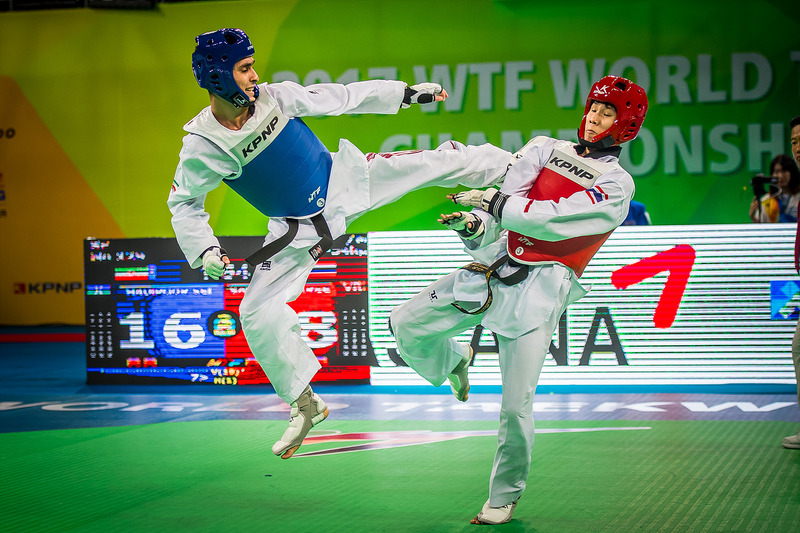 SEOUL, Korea (April 16, 2019) – The Manchester World Taekwondo Championships take place from May 15-19, at the Manchester Arena, UK. Which fighters will emerge victorious? It is literally hard to say. We will look at some of the key contenders in the Male -54, -58, -63 and -68kg categories through preview below. There is very good news for the players in this category: They will not be facing the three-time consecutive world champion – Puebla in 2013, Chelyabinsk in 2015 and Muju in 2017 – Tae-hun Kim of Team Korea, who sought to move up in weight to -58kg. This is particularly good news for Amin Hadipour Seighalani of Iran who is now the top ranked player in this division, but who had lost to Kim in the finals in Muju, taking silver. Absent Kim, Armin Hadipour Seighalani is now the clear favorite. But he needs to be fully prepared as there will be a wide field appearing in Manchester. Cesar Rodriguez from Mexico is one; Ramnarong Sawekwiharee of Thailand is another. A third is the widely experienced Moustapha Kama of Senegal and a fourth is the up-and-coming Korean Jun-seo Bae, who has strong in-fighting skills. The widely anticipated medalist was Tae-hun Kim of South Korea. 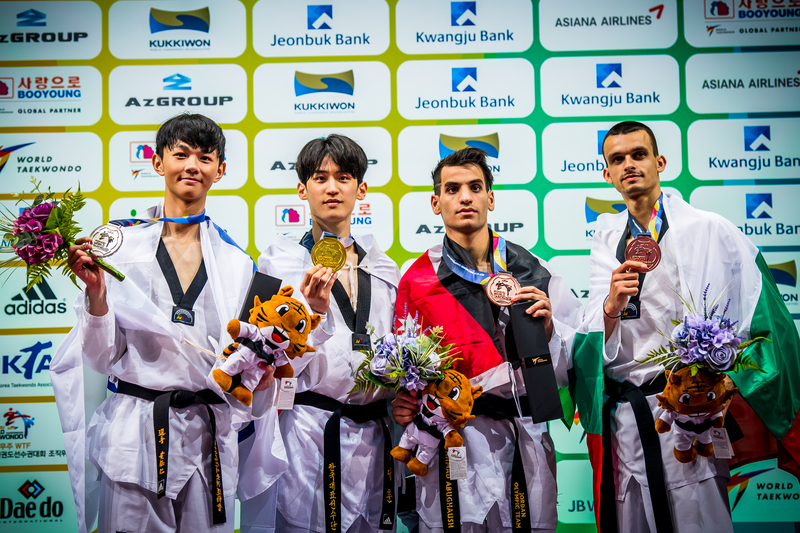 The triple, consecutive World Champion shifted up a weight from -54kg this year – only to be beaten in qualification by his youthful team mate, Jun Jang. Jang is a mere 19-years-old, but the wunderkind has been competing at the elite level and won the Fujairah Grand Prix Final in 2018. Having knocked out Kim in the qualifications, Jang is clearly a game changer and the man to beat. But anything can happen at the Worlds. Russia’s Mikhail Artamonov, who took silver at the Worlds Championships in Muju in 2017 is serious threat. However, the other outstanding player in the division, Mexico’s spectacular spin kicker Carlos Navarro, has moved up in weight. This looks set to be one of Manchester’s most spectacular and intriguing category, with Belgium’s Jaouad Achab, Mexico’s Carlos Navarro and Shuai Zhao of China all in with a chance of a win. Shuai won gold at the Rio Olympics in 2016 and at the World Championships in Muju in 2017 making him a very serious contender and, as one of the tallest players in the game. Achab is one of the feistiest and fluid fighters in the game and he always produces great matches. Then there is Mexico’s Navarro, who has shifted up in weight. Like Achab, he is a crowd-pleasing fighter, well noted for his barrage of jump spinning back kicks. 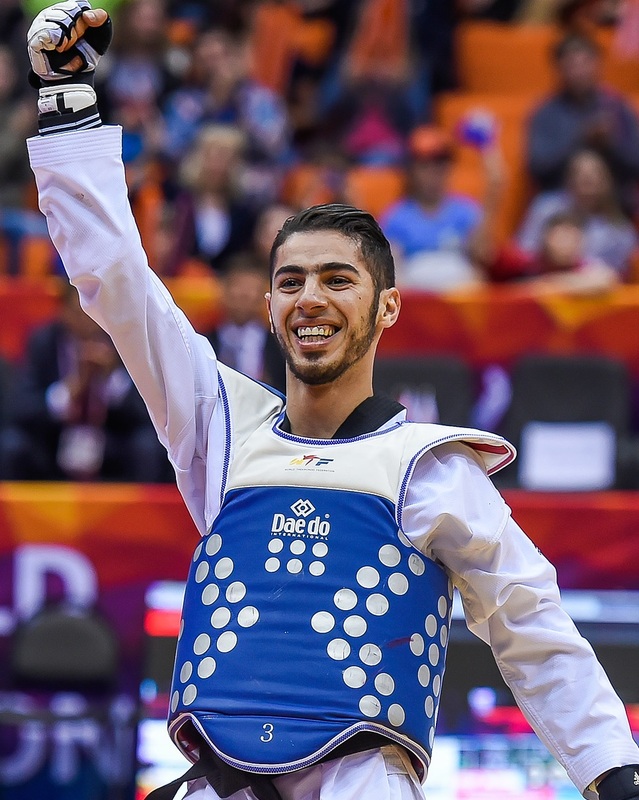 Outsiders, including Lovre Brecic of Croatia – one of taekwondo’s rising teams – and Ahmadi Soroush of Iran – making his first appearance at a World Championships – are also in with a chance in what is likely to prove one of the best categories at the tournament. Male -68kg: Gold Number 4 for Lee? Any player – however physically big he may be – looks small beside Dae-hoon Lee. The Korean demon trainer and devil kicker is arguably the most admired player in the sport. In the last four World Championships he has won three golds – in Gyeogju in 2011, in Puebla in 2013 and in Muju in 2017. He has also won an unprecedented 11 Grand Prix golds. Alexey Denisenko is a constant threat – he has silvers from Chelyabinsk in 2015 as well as a silver in Rio in 2016. But the Russian aerial kick specialist has always found Lee – who mixes brilliant tactical nous and fight preparation with physical mastery – a tough opponent. A Lee-Denisenko battle in the final would light up the Manchester Arena. The other players in this category who all eyes were set to be on is Jordan’s Rio 2016 gold medalist, Ahmad Abughaush. However, the “Desert Wolf” has moved up a weight category for the Worlds. Regardless, the Male -68kg category is always a sizzler – and is certain to provide crowd-pleasing battles in Manchester. The tickets are still available to buy from here!